I'll bet your mother never made ham and split pea soup like this! This is a marvelous recipe credited to the Magic Pan Restaurant. You can find this recipe posted on many sites, I found it on recipes-from-friends.com. It's a rich soup that is definitely what we call in our house "guest worthy", although I don't wait for guests to make it. 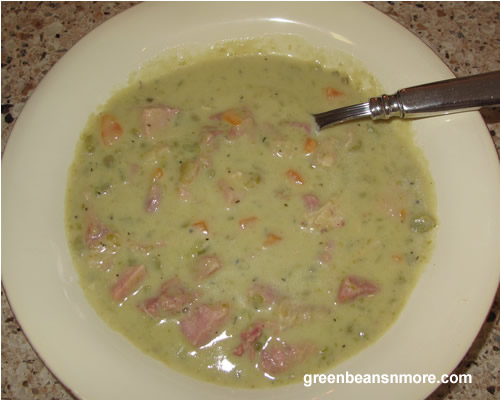 This green pea soup recipe will make you look forward to the next time you cook a ham. By the way, try our delicious holiday pineapple glazed ham recipe this soup is the perfect way to use the bone! 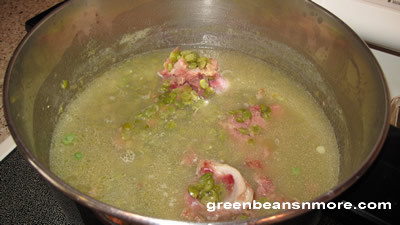 Place the ham bone in a large pot. Add the water, chicken stock and peas and bring to a boil over medium heat. Reduce the heat and simmer for thirty minutes, stirring occasionally. 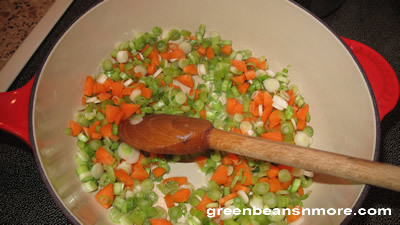 Saute the onions, carrots and celery in butter until limp. Add them to the soup pot along with all the seasonings and continue to simmer the mixture until the peas are very soft, about 45 minutes. Remove the ham bone. Stir in the milk and cream. Add the ham and chicken. Simmer, stirring occasionally 10 - 15 minutes. Can be served with a dollop of sour cream and chopped parsley. 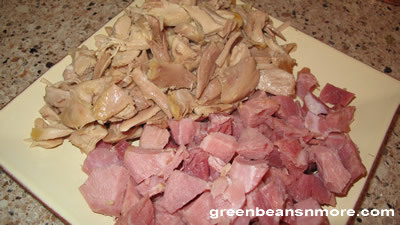 Cook's Tips: Before I put the ham bone in the water and stock I slice some of the meat off of it. After the bone has done it's work and is removed from the soup set it aside to cool. There is still a good bit of meat on it that can be added to the soup. I always add more ham and chicken than the recipe calls for. It helps to make the soup extra hearty. The recipe calls for you to saute the onions, carrots and celery until just limp. I use 1 - 1 1/2 tablespoons of butter to do this (this was left off of the original recipe). As green onions are much cheaper in the grocery store than leeks, and the recipe only calls for a small amount (2/3 cup), I use green onions. The recipe calls the addition of chicken "optional" but I always add it when I make this soup. 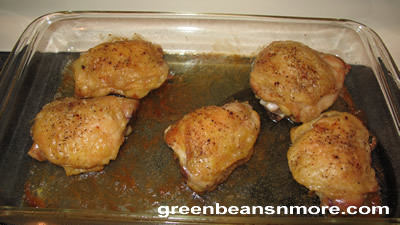 I like dark meat so I bake chicken thighs (with the skin on) to use in this soup. It really adds to the depth of flavor. You may find you need to add a bit more salt, I do. Don't add any additional salt until the soup is finished cooking.